Oklahoma is a South Central state of the United States (with strong Southern, Western, and Midwestern influences) and its U.S. postal abbreviation is OK; others abbreviate the state's name Okla. As of 2000, the population is 3,450,654. 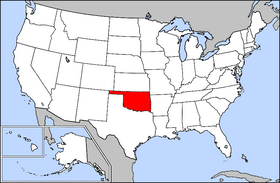 Oklahoma is bounded on the east by Arkansas and Missouri, on the north by Kansas and northwest by Colorado (both at 37°N), on the far west by New Mexico (at 103°W), and on the south and near-west by Texas. The panhandle's southern boundary is at 36.5°N, then turning due south along 100°W to the southern fork of the Red River), completing the round trip back to Arkansas. Oklahoma City is the capital and largest city. Oklahoma's natural terrain is very diverse, ranging from oak and hickory mixed forest in the wetter eastern part of the state, to the post oak and blackjack oak savannah territory of the Cross Timbers, to the plains and semi-arid regions of western Oklahoma and the panhandle. The state is one of the six states on the Frontier Strip. There have been several schemes used to breakdown Oklahoma into regions. Popular but "unofficial" regional designations include Green Country (most often used to refer to Northeastern Oklahoma but used by some to refer to all of Eastern Oklahoma), Little Dixie (Southeastern Oklahoma), Western Oklahoma, and the Oklahoma Panhandle. From a bioregional perspective, Oklahoma is recognized by the EPA as having 11 different ecoregions (one of only four U.S. states to have more than 10 ecoregions). These ecoregions are: Western high plains, Southwestern Tablelands, Central Great Plains, Tall Grass Prairie, Cross Timbers, Caves & Prairie, Ozark Highlands, Ozark Forest, Hardwood Forest, Ouachita Mountains, and Cypress Swamps & Forests. Oklahoma has the strongest thunderstorms in the entire world, because of the cold and warm airmasses colliding east of the Rocky Mountains, making the state the heart of Tornado Alley. Oklahoma was inhabited by Native American tribes including the Kitikiti'sh (Wichita) Quapaw, Caddo and Osage. Descendants of these peoples still live in the state. In the 16th century Spanish explorers became the first Europeans to visit the area. Later on Oklahoma was part of the vast territorial swapping going on between European powers France and Spain. In the 1830s Oklahoma, as the Indian Territory, served as the relocation area for the policy of Indian Removal started by Andrew Jackson. The end of the Trail of Tears (Tsa La Gi) was "Indian Territory". There were already many tribes living in the territory, whites, and escaped slaves as well. The "Five Civilized Tribes" were not the only ones forced to Oklahoma. Nations such as the Delaware, from the northeast U.S., Kiowa, Comanche, and others were forced to move to Oklahoma. The name Oklahoma comes from the language of the Choctaw people, who came in the 1830s. Okla roughly means "the people" and homa means "red." Alternatively, this may be a French name: "Okla" is "ochre" and "homa" is "homme," as the Indians were known by Louisiana Cajuns. The five civilized tribes set up towns such as Tulsa, Tahlequah, and Muskogee, which became some of the larger towns in the state. They also brought their African slaves to Oklahoma, which added to African-American population in the region. During the American Civil War many tribes were internally split between Confederates and Yankees. However, in 1861 the Cherokees, Creeks, Choctaws, Chickasaws, Seminoles, Quapaws, Senecas, Caddos, Wichitas, Osage Nation, and Shawnees signed treaties of alliance with the Confederacy. There were several battles fought in Oklahoma. After the Civil War, in 1866, the federal government forced the tribes into new treaties. Most of the land in central and western Indian Territory was ceded to the government. Some of the land was given to other tribes, but the central part, the so-called Unassigned Lands, remained with the government. Another concession allowed railroads to cross Indian lands. Furthermore the practice of slavery was outlawed. Some nations were integrated racially and otherwise with their slaves, but other nations were extremely hostile to the former slaves and wanted them exiled from their territory. In the 1870s a movement began by people wanting to settle the government lands in the Indian Territory under the Homestead Act of 1862. They referred to the Unassigned Lands as Oklahoma and to themselves as Boomers. In the 1880s, early settlers of the state's very sparsely populated Panhandle region tried to form the Cimarron Territory, but lost a lawsuit against the federal government, prompting a judge in Paris, Texas, to unintentionally create a moniker for the area. "That is land that can be owned by no man," the judge said, and after that the panhandle was referred to as No Man's Land until statehood arrived decades later. In 1884, in United States vs. Payne, the United States District Court in Topeka, Kansas, ruled that settling on the lands ceded to the government by the Indians under the 1866 treaties was not a crime. The government at first resisted but the Congress soon enacted laws authorizing settlement. Congress passed the Dawes Act, or General Allotment Act, in 1887 requiring the government to negotiate agreements with the tribes to divide Indian lands into individual holdings. Under the allotment system, tribal lands left over would be surveyed for settlement by non-Indians. Following settlement, many whites accused Republican officials of giving preferential treatment to ex-slaves in land disputes. The Dawes Act excluded the Five Civilized Tribes. On March 23, 1889, President Benjamin Harrison signed legislation by the U.S. Congress which would open up the Unassigned Lands (some 2 million acres (8,000 km²), for settlement on April 22nd. It was to be the first of a number of "Land runs" (due to widespread cheating later land openings were conducted by means of a lottery). Some of the settlers were called "Sooners" because they had already staked their land claims before the land was officially opened for settlement. The Organic Act of 1890 created the Oklahoma Territory out of the Unassigned Lands and No Man's Land. In 1893 the government purchased the rights to settle the "Cherokee Outlet," or "Cherokee Strip," from the Cherokee Nation. The Cherokee Outlet was part of the lands ceded to the government in the 1866 treaty but with the Cherokees retaining access. Chicago meat-packing plants had leased it from the Cherokees for huge cattle ranches. The Cherokee Strip was opened to settlement by land run in 1894. Also, in 1893, Congress set up the Dawes Commission to negotiate agreements with each of the Five Civilized Tribes for the allotment of tribal lands to individual Indians. Finally, the 1898 Curtis Act abolished tribal jurisdiction over all of Indian Territory. On November 16, 1907, Oklahoma Territory combined with Indian Territory to become the 46th U.S. state. In the early 1900s the oil business began to get underway. Huge pools of underground oil were discovered in places like Glenpool. Many whites flooded into the state to make money. Many of the "old money" elite families of Oklahoma can date their rise to this time. The prosperity of the 1920s can be seen in the surviving architecture from the period, including one which was converted into the Philbrook Museum. For Oklahoma, the early 1900s were also somewhat turbulent politically. Many different groups had flooded into the state and were trying to figure out how to live. There were also "black towns", in which blacks tried to make a life of their own, separate from whites. The white towns were also segregated. Northern Tulsa was known as Black Wall Street because of the vibrant business, cultural, and religious community that had sprung up there. The Oklahoma Socialist Party did achieve a fair degree of success in this era (the party had its highest per-capita membership in Oklahoma at this time with 12,000 dues paying members in 1914), including the publication of dozens of party newspapers and the election of several hundred local elected officials. Much of their success came from their willingness to reach out to Black and American Indian voters (they were the only party to continue to resist Jim Crow laws), and their willingness to alter traditional Marxist ideology when it made sense to do so (the biggest changes were the party's support of widespread small-scale land ownership, and their willingness to use religion positively to preach the "Socialist gospel"). The state party also delivered Presidential candidate Eugene Debs some of his highest vote counts in the nation. The party was later crushed into virtual non-existence during the "white terror" that followed the ultra-repressive environment following the Green Corn Rebellion and the World World I era paranoia against anyone who spoke against the war or capitalism. The Industrial Workers of the World tried to gain headway during this period, but achieved little success. The Ku Klux Klan was also active, denouncing Blacks, Catholics, and Jews. There were several race riots, including the Tulsa Race Riot, one of the worst in American history. During the height of the Great Depression, drought and non-ecologically-friendly agricultural practices led to the Dust Bowl, when massive dust storms blew away the soil from large tracts of arable land and deposited it on nearby farms and ranches, distant states, the Atlantic Ocean, and even occasionally Great Britain. The resulting crop failures forced many small farmers to flee the state altogether. Although the most persistent dust storms primarily affected the Panhandle, much of the state experienced occasional dusters, intermittent severe drought, and occasional searing heat. Towns as far-flung as Alva, Altus, and Poteau each recorded temperatures of 120 °F during the epic summer of 1936. Advances in agro-mechanical technology simultaneously enabled less labor-intensive crop production. Many large landowners and planters had more labor than they needed with the new technology, and the federal Agricultural Adjustment Act paid them to reduce production. Plantation owners throughout the American South and much of eastern and southern Oklahoma released their sharecroppers of their debts and evicted them. With few or no local opportunities available for them, many emancipated but destitute blacks and whites fled to the relative prosperity of California to work as migrant farm workers and, after the onset of World War II, in factories. The Grapes of Wrath by John Steinbeck, photographs by Dorothea Lange, and songs of Woody Guthrie tell often-exaggerated tales of woe from the era. The negative images of the "Okie" as a sort of rootless migrant laborer living in a near-animal state of scrounging for food greatly offended many Oklahomans. These works often mix the experiences of former sharecroppers of the western American South with those of the exodusters fleeing the fierce dust storms of the High Plains. Although they primarily feature the extremely destitute, the vast majority of the people, both staying in and fleeing from Oklahoma, suffered great poverty in the Depression years. Some Oklahoma politicians denounced The Grapes of Wrath (often without reading it) as an attempt to impugn the morals and character of Oklahomans. The term "Okie" in recent years has taken on a new meaning in the past few decades, with many Oklahomans (both former and present) wearing the label as a badge of honor (as a symbol of the Okie survivor attitude). Others (mostly alive during the Dust Bowl era) still see the term negatively because they see the "Okie" migrants as quitters and transplants to the West Coast. Major trends in Oklahoma history after the Depression era included the rise again of tribal sovereignty (including the issuance of tribal automobile license plates, and the opening of tribal smoke shops, casinos, grocery stores, and other commercial enterprises), the building of Tinker Air Force Base, the rapid growth of suburban Oklahoma City and Tulsa, the drop in population in Western Oklahoma, the oil boom of the 1980s and the oil bust of the 1990s. Also in this century came the gradual elimination of the prohibition of alcoholic beverages, first through the legalization of beverages containing 3.2% alcohol or less, then through the legalization of stronger alcoholic beverages sold only in bottles, and finally in the legalization of "liquor by the drink" in the 1980s. Currently, Oklahoma's liquor laws are still fairly unusual in that only 3.2% beer can be sold in grocery/convenience stores, while higher-alcohol-content beverages must be sold in liquor stores with limited hours of operations. In 1995 Oklahoma became the scene of the Oklahoma City bombing, in which a man named Timothy McVeigh bombed the Alfred P. Murrah Federal Building, killing 168 people. Oklahoma City has also been the home of Spiritual Walk for Peace, an ongoing series of peaceful peace demonstrations in downtown Oklahoma City conducted by members of the city's religious/peace communities. The capital of the state is Oklahoma City and its governor is Brad Henry (Democrat). Oklahoma's state legislature consists of a Senate and a House of Representatives. The Senate has 48 members serving four-year terms, while the House has 101 members with two year terms. The state has term limits for their legislature that restrict any one person to a total of twelve years service in both the house and senate. In the 2005–2006 state legislature, control is split between the major parties, the Democrats control the Senate (26 to 22) while the Republicans control the House (57 to 44). This changes the government's make-up since before the 2004 election the Democrats controlled both chambers since 1921. The state's judicial branch consists of the Oklahoma Supreme Court, the Court of Criminal Appeals, and 77 District Courts which serve one county apiece. Oklahoma is unique in that it has two courts of last resort, the state Supreme Court hears civil cases, and the state Court of Criminal Appeals hears criminal cases. Judges of those two courts, as well as the Court of Civil Appeals are appointed by the Governor upon the recommendation of the state Judicial Nominating Commission, and are subject to a non-partisan retention vote on a six-year rotating schedule. Due to Oklahoma's restrictive ballot access laws (deemed by many to be the most restrictive in the nation), no third parties have access to the primary ballots, however the state does have the following active third parties: Oklahoma Libertarian Party, Green Party of Oklahoma, Oklahoma Constitution Party. There are also organizers from the Communist Party USA working in the state. The state is divided into 77 counties which deliver local government. Each is governed by a three member commission. Other county elected officials are the tax assessor, clerk, court clerk, treasurer, and sheriff. Cities and towns are established under the rights granted in the Oklahoma statutes (in comparison, Oklahoma gives municipal governments a great deal of latitude in chartering new governments). Towns are municipalities of under 1000 residents, while cities have more than 1000 residents. Major cities are also allowed to form "charter governments," in which the voters choose the form of government they want to use in place of the statutory forms. Other local government units in Oklahoma include independent and dependent school districts, Vo-tech center districts, community college districts, rural fire departments, rural water districts, and other special use districts. After the 2000 census the Oklahoma delegation to the U.S. House was reduced from six to five representatives. For the 109th Congress (2005–2006) there are no changes in party strength, and the delegation has four Republicans and one Democrat. Oklahoma's two U.S. senators are James M. Inhofe (Republican) and Tom Coburn (Republican). The U.S. Representatives are John Sullivan (Republican) of District 1, Dan Boren (Democrat) of District 2, Frank D. Lucas (Republican) of District 3, Tom Cole (Republican) of District 4, and Ernest Istook (Republican) of District 5. Interestingly, Oklahoma has been a staunch Republican state in national politics recently, voting for the Republican in every election since 1964. (although the 1976 Carter-Ford race was close). In 2004, George W. Bush carried every county in the state. His victory in winning Oklahoma's 7 electoral votes was by the overwhelming margin of 32 percentage points and 65.6% of the vote. Yet, despite this, there are still more registered Democrats in Oklahoma than Republicans. Oklahoma is a major fuel and food-producing state. Thousands of oil and natural gas wells dot the Oklahoma landscape. Millions of white-faced beef cattle graze on Oklahoma's flat plain and low hills. Fertile fields produce vast crops of wheat. Its 1999 total gross state product was $86 billion, placing it 29th in the nation. Its 2000 per capita personal income was $23,517, 43rd in the nation. Its agricultural outputs are cattle, wheat, milk, poultry, and cotton. Its industrial outputs are transportation equipment, machinery, electric products, rubber and plastic products, and food processing. Oklahoma City is the principal economic engine of the state, centered on the finance, retail, governance, entertainment, and tourism sectors. The city has numerous manufacturing and processing plants as well as a growing biotech center and a large aviation market; its location at the intersection of I-35, I-40, and I-44 make Oklahoma City an important distribution and shipping point. Oklahoma City is home to many corporate and regional headquarters including Kerr-McGee, Six Flags, Sonic Drive-In, SBC Communications, The Hertz Corporation, and America Online. Tulsa is centered around energy, aerospace and telecommunications. The city has the nation's most inland waterport. Companies based in Tulsa include Williams, Oneok, Wiltel, QuikTrip, Mazzio's Corporation, Dollar-Thrifty, and Vanguard. Other employers include MCI, TV Guide, SBC Communications, Dish Network, DirecTV, USCellular, Cingular, and Onex. Tulsa is also home to an American Airlines maintenance center, the largest airline maintenance base in the world. According to the U.S. Census Bureau, as of 2003, Oklahoma's population was estimated at 3,511,532 people. The five largest ancestry groups in Oklahoma are German (14.5%), American (13.1%), Irish (11.8%), English (9.6%), Native American (7.9%, with Cherokees as the largest single tribe). Southeastern and south-central Oklahoma are inhabited principally by Southerners of American ancestry. German-Americans are present in the state as well, especially in the northwestern part of the state. American Indians predominate in eastern Oklahoma. Oklahomans of British ancestry dominate Tulsa and some other areas. Blacks are a plurality in Lawton and Oklahoma City, while Pittsburg county has many Irish-Americans. A few western counties have significant Mexican populations. 6.8% of Oklahoma's population were reported as under 5, 25.9% under 18, and 13.2% were 65 or older. Females made up approximately 50.9% of the population. Descendants of these people still live in Oklahoma today. Counties with the names of these tribes also exist. Oklahoma has the second highest number of Native Americans/Amerindians in the country estimated at 395,219 as of 2003. Only California has a higher Amerindian population at 682,720. Oklahoma also has the second highest concentration of Native Americans/Amerindians in the nation with 11.4% of the state's population, topped only by Alaska at 19% of that state's population. Oklahoma, in common with five other Midwestern states (Nebraska, Kansas, North Dakota, South Dakota and Iowa), is feeling the brunt of falling populations in many communities. 89% of the total number of cities in those states have fewer than 3000 people; hundreds have fewer than than 1000. Between 1996 and 2004 almost half a million people, nearly half with college degrees, left the six states. "Rural flight" has led to offers of free land and tax breaks as enticements to newcomers in some of these states. 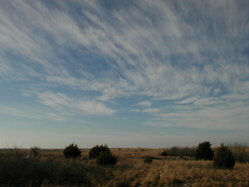 The effects of rural flight in Oklahoma have mostly been felt in Western Oklahoma (those areas west of Interstate 35). The various government sponsored arts, community, and tourism programs emphasize Oklahoma's Native American heritage heavily. Other ethnic celebrations include those of Yukon & Prague (celebrating the Czech heritage of some early immigrants), the Mennonite Relief Sale (in Enid, OK), traditional Asian, African American, and Hispanic celebrations in Oklahoma City as well as the Pride parade and festival in its GLBT district, and the Juneteenth Celebrations found all across the state.